A. What the Science of Right is. The Science of Right has for its object the principles of all the laws which it is possible to promulgate by external legislation. Where there is such a legislation, it becomes, in actual application to it, a system of positive right and law; and he who is versed in the knowledge of this system is called a jurist or jurisconsult (jurisconsultus). A practical jurisconsult (jurisperitus), or a professional lawyer, is one who is skilled in the knowledge of positive external laws, and who can apply them to cases that may occur in experience. Such practical knowledge of positive right, and law, may be regarded as belonging to jurisprudence (jurisprudentia) in the original sense of the term. But the theoretical knowledge of right and law in principle, as distinguished from positive laws and empirical cases, belongs to the pure science of right (jurisscientia). 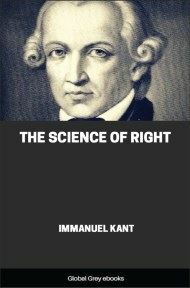 The science of right thus designates the philosophical and systematic knowledge of the principles of natural right. And it is from this science that the immutable principles of all positive legislation must be derived by practical jurists and lawgivers. This question may be said to be about as embarrassing to the jurist as the well-known question, “What is truth?” is to the logician. It is all the more so, if, on reflection, he strives to avoid tautology in his reply and recognise the fact that a reference to what holds true merely of the laws of some one country at a particular time is not a solution of the general problem thus proposed. It is quite easy to state what may be right in particular cases (quid sit juris), as being what the laws of a certain place and of a certain time say or may have said; but it is much more difficult to determine whether what they have enacted is right in itself, and to lay down a universal criterion by which right and wrong in general, and what is just and unjust, may be recognised. 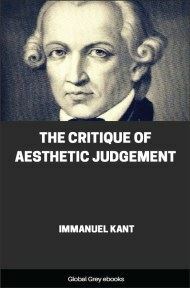 All this may remain entirely hidden even from the practical jurist until he abandon his empirical principles for a time and search in the pure reason for the sources of such judgements, in order to lay a real foundation for actual positive legislation. In this search, his empirical laws may, indeed, furnish him with excellent guidance; but a merely empirical system that is void of rational principles is, like the wooden head in the fable of Phaedrus, fine enough in appearance, but unfortunately it wants brain. 1. The conception of right — as referring to a corresponding obligation which is the moral aspect of it — in the first place, has regard only to the external and practical relation of one person to another, in so far as they can have influence upon each other, immediately or mediately, by their actions as facts. 2. 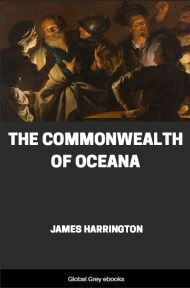 In the second place, the conception of right does not indicate the relation of the action of an individual to the wish or the mere desire of another, as in acts of benevolence or of unkindness, but only the relation of his free action to the freedom of action of the other. 3. And, in the third place, in this reciprocal relation of voluntary actions, the conception of right does not take into consideration the matter of the act of will in so far as the end which any one may have in view in willing it is concerned. In other words, it is not asked in a question of right whether any one on buying goods for his own business realizes a profit by the transaction or not; but only the form of the transaction is taken into account, in considering the relation of the mutual acts of will. Acts of will or voluntary choice are thus regarded only in so far as they are free, and as to whether the action of one can harmonize with the freedom of another, according to a universal law. 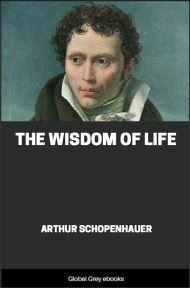 Right, therefore, comprehends the whole of the conditions under which the voluntary actions of any one person can be harmonized in reality with the voluntary actions of every other person, according to a universal law of freedom. C. Universal Principle of Right. If, then, my action or my condition generally can coexist with the freedom of every other, according to a universal law, any one does me a wrong who hinders me in the performance of this action, or in the maintenance of this condition. For such a hindrance or obstruction cannot coexist with freedom according to universal laws. It follows also that it cannot be demanded as a matter of right, that this universal principle of all maxims shall itself be adopted as my maxim, that is, that I shall make it the maxim of my actions. For any one may be free, although his freedom is entirely indifferent to me, or even if I wished in my heart to infringe it, so long as I do not actually violate that freedom by my external action. Ethics, however, as distinguished from jurisprudence, imposes upon me the obligation to make the fulfillment of right a maxim of my conduct. The universal law of right may then be expressed thus: “Act externally in such a manner that the free exercise of thy will may be able to coexist with the freedom of all others, according to a universal law.” This is undoubtedly a law which imposes obligation upon me; but it does not at all imply and still less command that I ought, merely on account of this obligation, to limit my freedom to these very conditions. 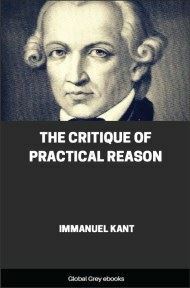 Reason in this connection says only that it is restricted thus far by its idea, and may be likewise thus limited in fact by others; and it lays this down as a postulate which is not capable of further proof. As the object in view is not to teach virtue, but to explain what right is, thus far the law of right, as thus laid down, may not and should not be represented as a motive-principle of action.